Have you ever marveled at the color of leaves in autumn? The leaves actually bear those beautiful warm colors the whole time, but the oranges, yellows and reds are overpowered by the green produced through photosynthesis. When in the fall that process begins to wane, the leaves' true colors are revealed. They were always more beautiful than we ever realized; we finally see their most glorious hues just before they leave us. 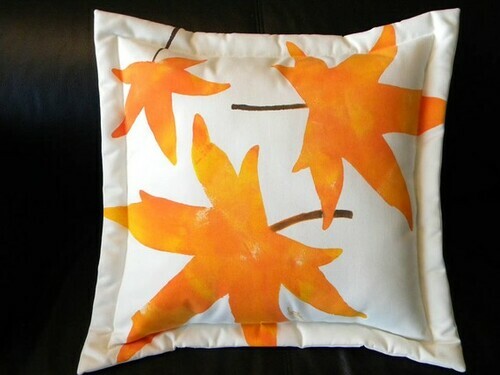 These 19"x19" indoor-outdoor pillows are handpainted with the leaf motif of the sweetgum or liquidamber tree. The smooth acrylic fabric resists rain, sun, hail, sleet and fruitfly droppings. Spot cleans easily with a bit of soap and water, garden hose, or can even be machine washed cool/gentle; air dry. Nontoxic textile paints have been heat set for permanence and the removable polyester fiberfill insert removes easily for laundering. Designed, painted, sewn, stuffed, signed and copyrighted by the artist on an island in Washington State where the arrival of autumn prompts people to drive around gawking at the colorful spectacle and taking lots of photos. No need to go to those measures when you have these big, bright leaves on your sofa or deck chair. Enjoy! Note: Hand painted for you, no two are alike. Custom made upon order. Production time is about 4 weeks. Custom made for you. Not eligible for return or exchange. Please view our return policy for more information. Ships ground service.